Tree trimming or removal is dangerous work. Arborists have accident rates 10 times greater than the all-industry average, however, based on emergency room statistics, homeowners are 5 times more likely to cause injury or death while involved in tree maintenance or removal. Safety is easily overlooked when there is a job to do but it could have life alter consequences. I cannot believe my luck! In the process of writing this article look what I found on Facebook! Let’s break this picture down: No hard hats, using a ladder for removal, there is no bark on that tree so it is dead, really dead (unsafe to climb), it looks like they smashed the fence to me, what happens when the tree branch strikes the guy on the ladder? The power line in the foreground of this picture poses a potential safety risk. Honey do not hire this guy for tree work! 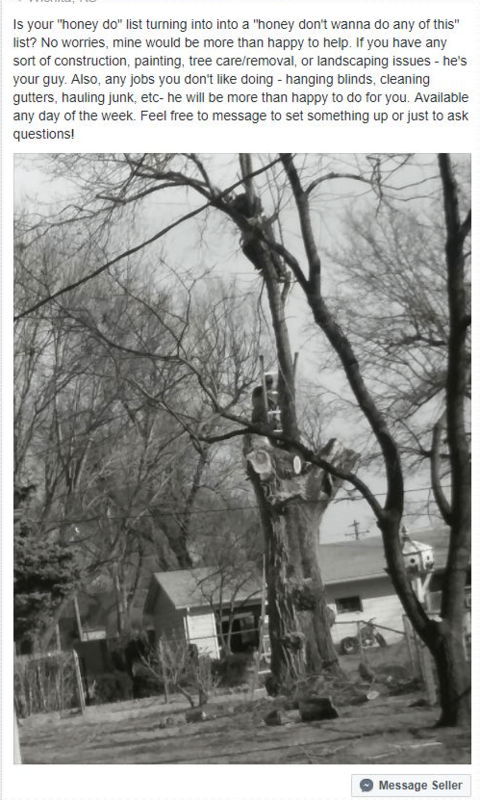 Because of these risks the arboricultural industry has some of the highest workers compensation in the nation. Guys who do not carry insurance can undercut prices of established tree companies, but it comes with risks. Uninsured workers leave you liable for damages and injuries that occur on your property. With an industry-wide accident rate like ours, who wants to take that chance. At Wellnitz Tree Care we are constantly learning and improving our skills and awareness. Our company made the commitment to send one of our employees through the Tree Care Industry Association’s Certified Tree Care Safety Professional course. At the time, he was one of the first CTSP’s in Kansas and at the time of this article, there are only 6 companies in the state who employ a CTSP. What steps do we take to ensure your safety and ours? All new employees attend an orientation safety meeting before they start. National safety standards such as the ANSI Z133 and OSHA policies are enforced at Wellnitz Tree Care. We conduct safety meetings at the beginning of each week covering various topics that pose risks to workers. We practice aerial rescues in the event that a worker is injured or equipment fails while aloft. Wellnitz Tree Care equips our teams with the proper safety gear before they enter the field. You are protected from loss by our insurance policy while we are working on your property. Wellnitz Tree Care strives to be among the safest tree care operations in the nation. Click the link below to review nationwide incident reports.